Japan wants Russia to scale down its military presence on the disputed island chain. Japan asked Russia to reduce its military activities on a disputed island chain, known as the Kurils in Russia and the Northern Territories in Japan, during “two-plus-two” security talks between the foreign and defense ministers of Japan and Russia held in Moscow on July 31, according to Japanese Defense Minister Itsunori Onodera. The Japanese MoD singled out the deployment of Russian military aircraft on the disputed islands as a particular source of concern. In March 2018, the Russian Air Force deployed two Su-35S fighters to an airfield on Iturup (Etorofu in Japanese) — the largest and northernmost island in the southern Kurils — for the first time. The arrival of the aircraft was preceded by Russian Prime Minister Dmitry Medvedev signing a decree permitting the deployment of military aircraft to the civilian airport in February 2018. Japan’s Ministry of Foreign Affairs (MoFA) lodged an official protest over the issue in the same month. Russia’s military activities are seen in response to Moscow’s concern over the possible procurement of two U.S.-made land-based Aegis Ashore ballistic missile defense batteries by Japan. The Russian ministers once again officially restated their concerns over the deployment of the Aegis Ashore ballistic missile defense systems during the two-plus-two dialogue in Moscow on Tuesday. Russia is also concerned over the stationing of additional U.S. missile defense systems to Northeast Asia. For example, Russian President Vladimir Putin has repeatedly expressed his apprehension over the deployment of the Terminal High-Altitude Area Defense (THAAD) system to South Korea. The disputed Northern territories – known in Japanese as the Shikotan, Kunashiri, Etorofu and the Habomai islets – located in the Sea of Okhotsk in the Northwest Pacific, were seized by the Soviet Union in 1945. By 1949 the Russians had expelled all 17,000 Japanese residents of the islands. Under the 1951 San Francisco Peace Treaty, Tokyo renounced “all right, title and claim to the Kuril Islands”; however, Moscow never signed the peace treaty and Tokyo refused to concede that the four disputed islands were in fact part of the Kuril chain. 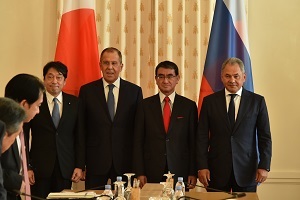 Japan has repeatedly rejected Moscow’s offer to settle the dispute with the return of the two smallest territories of the chain, Habomai and Shikotan. The increasing Russian military presence on the disputed island chain is bound to accentuate the ongoing disagreement between Moscow and Tokyo. The deployment of Russian military aircraft (as of now not on a permanent basis) is just one item of a list of Japanese concerns regarding Russian military activities on the islands. The Russian Navy has also been considering establishing a permanent naval base for its Pacific Fleet on one of the islands. Furthermore, the Russian MoD announced that it will deploy an army division there. Additionally, Russia stationed anti-ship and missile defense systems on the disputed territories in 2016. Nonetheless, during this week’s two-plus-two security talks, Russia and Japan agreed to deepen security cooperation. Among other things, they agreed to continue military exchanges and work toward the denuclearization of North Korea. Both countries also consented to a visit of a Japanese fact-finding mission to the disputed island chain from August 16 to 20 to continue the ongoing dialogue between the two sides and work toward a possible solution to the decades-old conflict.